Public To EPA On Cutting Regulations: 'No!' 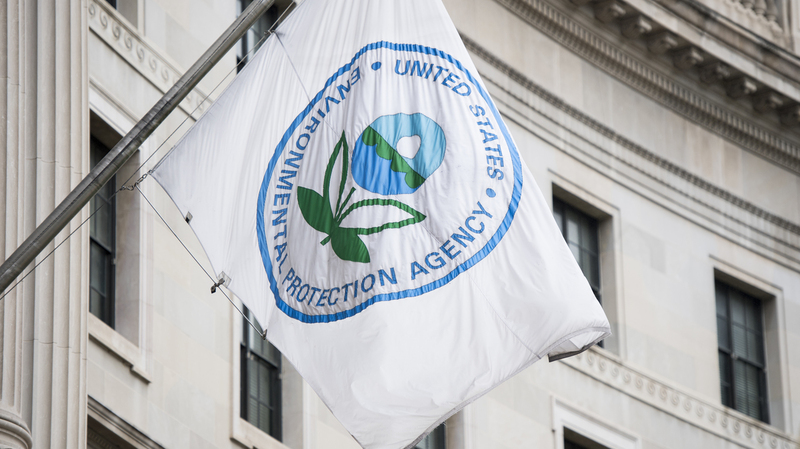 : The Two-Way The Environmental Protection Agency asked for public input on "job-killing regulations" and has received more than 28,000 comments, many of which urge the agency not to roll back protections. The Environmental Protection Agency have been hard-pressed to find any advocates for rolling back regulations in an online public comment forum. "The EPA saves lives," wrote Benjamin Kraushaar, who described himself as a hydrologist, hunter and fly fisherman. He wrote that environmental regulations "ensure safe air and water for our future generations. This should not be even up for debate." "The problem isn't regulation," wrote Marcia Nichols in another comment. "It's with greedy corporate leaders who are more concerned about the bottom line." Like many others, she credited the EPA with improving air and water that were visibly polluted in the 1970s. "I remember orange skies over cities, acid rain eroding statues in parks, frequent boil orders for water," she wrote. A military veteran and entrepreneur wrote, "I'm well aware that excessive regulation can impose an undue burden." However, continued Jeff Baker, "what is less discussed these days are the economic and societal costs already avoided and prevented by current rules." Others criticized EPA Administrator Scott Pruitt for questioning climate science, talked about the importance of keeping curbs on carbon emissions from coal-fired power plants and said that regulations, too, can create jobs. One commenter simply filled an entire page with "no no no no no no." Scrolling through the comments, it's hard to find any that advocate rolling back regulations. But there are some who took the agency's request to heart. Richard Doherty wrote that he oversees the cleanup of contaminated sites and has a problem with regulation "40 CFR Part 261 Subpart D." Often, he wrote, material that's not actually hazardous has to be treated as such, which wastes money and ends up doing "more environmental harm than good." WorkBoat.com also reported on comments from the American Waterways Operators association, which applauded Trump for recognizing that "burdensome rules stifle business." The site for commercial marine professionals said it needs more consistent regulations governing interstate commerce by water. It also asked the administration to review one regulation on sewage discharge and another on emissions standards for certain diesel engines. EPA spokeswoman Liz Bowman says the agency "appreciates all of the public comments" and will consider them in "identifying potential opportunities to reduce regulatory burdens," as directed by the president. She says an EPA task force expects to submit a progress report on that effort by Thursday. During a commencement address at the Coast Guard Academy this week, Trump said, "I've loosened up the strangling environmental chains wrapped around our country and our economy." The White House budget proposal would shrink EPA funding by nearly a third, the biggest cut of any agency. But EPA isn't the only part of government that the administration wants to potentially downsize. In another executive order, Trump has mandated that federal agencies repeal two regulations for every new one they create. Environmental groups allege that's unlawful and have sued to stop the directive. In the Senate this week, lawmakers took up the Regulatory Accountability Act, which would require all agencies to consider the cost of a regulation when creating it. Oil and gas and other industry groups laud the bill as promoting "good governance" and "accountability," while environmental groups complain that it would "emphasize costs to industry over benefits to Americans."